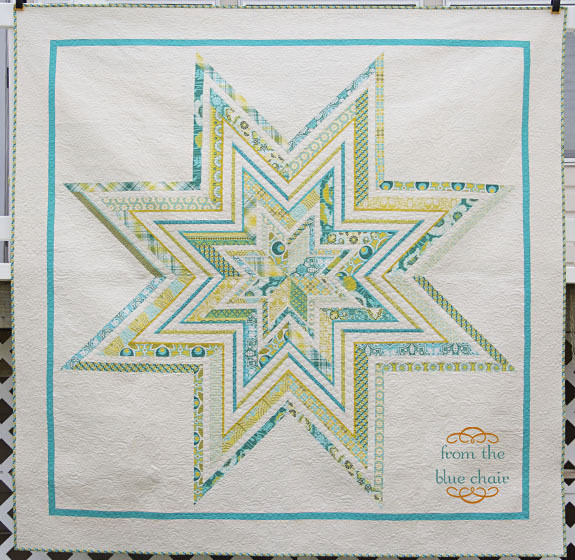 from the blue chair: Jumbo Star Quilt--Finished! I have been just a little obsessed with this quilt lately. It seems most of my quilting posts and Instagram pics have been about this quilt. My husband even commented that I've been abnormally excited about finishing it up. I finished quilting it Saturday evening and put the binding on Sunday afternoon. I love it all finished! It's about 80" square. The fabrics are primarily Notthing Hill with a few accent fabrics from Art Gallery (Pure Elements and Oval Elements). The back is made from a couple larger pieces of my favorite Notting Hill prints. The neutral is Kona Bone. The main quilting designs are swirls and pebbles. I chose to do the outer border in a combination of the two designs to tie it together. Adding the pebbles made quilting the narrow border easier as it gave me a filler to complete small spaces where a swirl wouldn't work well. This is the most adventurous I've ever been on the actual quilting. I found these smaller swirls worked quite well on my domestic machine. I will definitely do this design again. It took most of my kid-free time last week, but was completely worth it. I'm glad I took the extra time on this particular quilt. It needed special quilting. As I mentioned in my last post, I plan to hang this with my guild's non-judged display at HMQS next month. All it needs is a sleeve and label and it's ready to go! Tutorials for this quilt are located here and here. I do plan to write a tutorial down the road about piecing it all together, but that probably won't be for a while. With the nicer weather, I anticipate it will be a bit slower on the blog front. I know several people are creating their own star quilts inspired by this one. I'd love to see them! Please take a second to post them in my Flickr group or send me a couple pictures. I really love this quilt. The quilting is wonderful too! It turned out so beautiful! The fabrics you chose go together so well! I've been hand quilting a 90x90 star quilt for almost 2 years now, and this is definitely inspiring me to get back to work on it! So awesome, Kati! I can see why you've been obsessed! I adore this quilt. I haven't started to make my own yet, because I have to finish two or three others first, but oh, I will! And everytime I see another picture of it, I want to make it more and more. 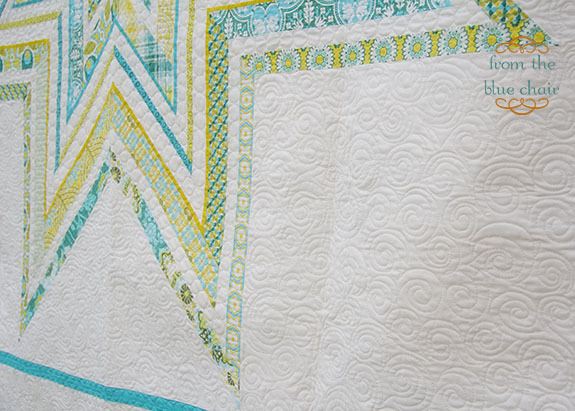 Kati, it is stunning, and the quilting is perfect!! you did such a beautiful job on this! 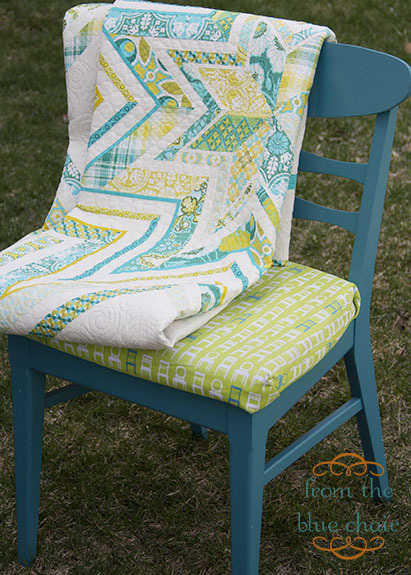 love the fabrics and your quilting is so perfect for this piece. Your quilt is beautiful! And you did a great job on the quilting. Oh this is heavenly!!! I am so in love!!! great great job. I so want to make one! Stunning quilt! 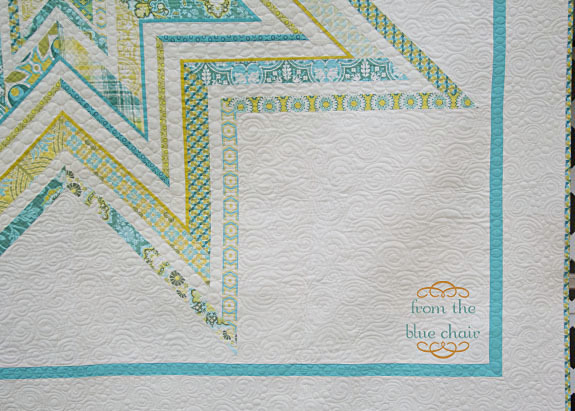 The quilting is gorgeous on it! Ooh it's fab, love the star and that fabric combo with it. Magnificent! Love the fabric, pattern, well everything really. 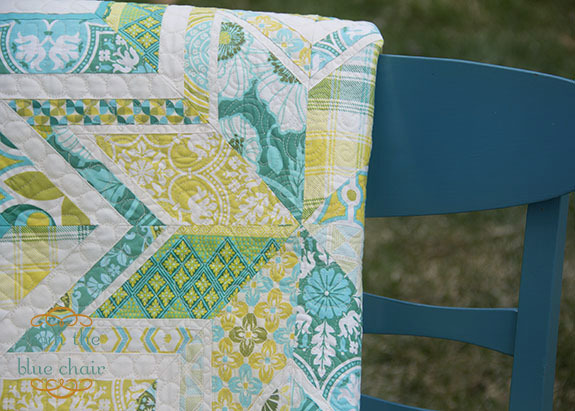 Great color combo and the quilting is perfect. Wow it is absolutley beautiful - I'd be excited if I ever finished something like this too. It's fabulous! Wow! That's a work of art! Way to go! I have to be brave and try out new quilting designs as well. Looks wonderful on the white space. So pretty! I'm glad you are deciding to display it! This really turned out great!! 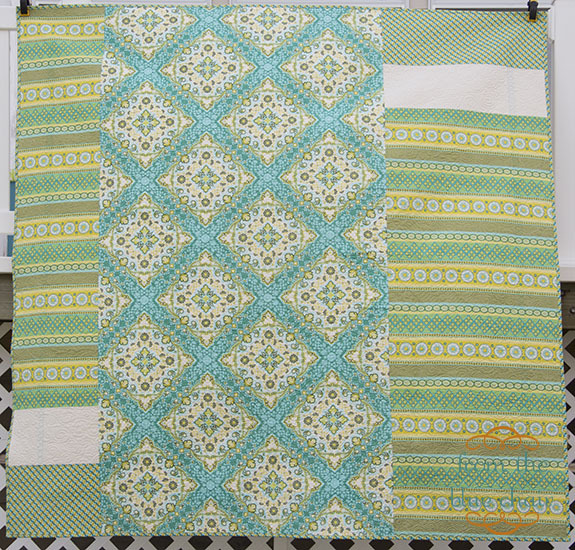 Your quilting is awesome, love the added pebbles to the outer border! So beautiful! I really love the colours in this and the quilting is just perfect. You should be proud, it's great. This is so beautiful! I'm not surprised that you were obsessed by the project, I sure would be if it were mine. Wonderful! Those Joel Dewberry prints are just happy to look at, but you made them a work of art. I love your quilting, and the fact that you did it all yourself. It looks like custom long arm work - and on such a huge quilt! I'll have to give those swirls a try - I love the texture. Simply lovely. I couldn't believe that you did that on your machine instead of a long arm. Just goes to show that beautiful quilting can be done on all sorts of machines. Fabulous! THe colors really set off the star. This is gorgeous! I was planning a giant star quilt for my bed... I think I want to do the paper pieced! Thanks for the tutorial!